The tug De Mist, now recovered by Navy divers, will, it appears, be alongside in Simon’s Town harbour for the foreseeable future. 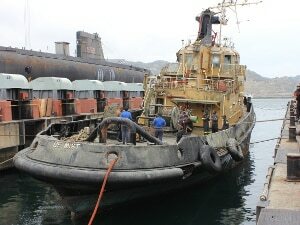 The workhorse was decommissioned more than three years ago and was, according to the maritime service of the SA National Defence Force (SANDF), up for disposal. While it might be “up for disposal” it appears the necessary paperwork has not been done with Armscor stating the out-of-service vessel “has not been moved to Armscor Defence Disposal Solutions as a stock item”. This in turn means there has been no active marketing of the disused tug by the State-owned defence and security acquisition agency. It also means, according to Armscor Group Executive: Corporate Support Solomzi Mbada, that no disposal value has been put on the tug. De Mist sank while moored in harbour early in November and initial attempts at keeping her above water failed. A decision to utilise own resources to refloat De Mist saw Navy divers using an array of lifting bags and submersible pumps after a comprehensive assessment by the Naval Engineering Department and Armscor Dockyard technical personnel. On November 28, after all leaks were plugged, lifting efforts were concentrated aft of the tug and she was raised and brought to within two metres of the quay with her keel on bedrock. The forward side of the tug was the given the same treatment and finally the harbour’s mooring lighter with assistance of tug Umalusi’s winch. The salvage operation was cited as a good example of what can be achieved by teamwork and resourcefulness by “a dedicated team of professionals working tirelessly to solve numerous mathematical, physical and engineering problems,” a Navy spokesman said.